I’m going to start out by saying I’m not perfect. I have moments where I react to situations in the wrong way. I let my impulse guide the response. The outcome usually isn’t good – blinded by my feelings, I neglect to think about the other person. Then I immediately feel guilty. I feel bad for the way I made the other person feel. I feel bad that they saw a side of me that I am not proud of. Luckily this is not too often of an occurrence, but it happens. Sound familiar to any of you? It’s an insert foot in mouth now moment. After it’s all said and done, I analyze what I might have done differently (my learning process). Could my tone have been different? Could I have chosen better words? Then I move to could I have listened better? Could I have stepped into their shoes and put aside my feelings? When this does happen, I’ll find a way to apologize if the opportunity exists. Sometimes though, your impulsive reaction is the only interaction you’ll have with the person. Wouldn’t it be awesome if you could improve your interactions both at work and personally? 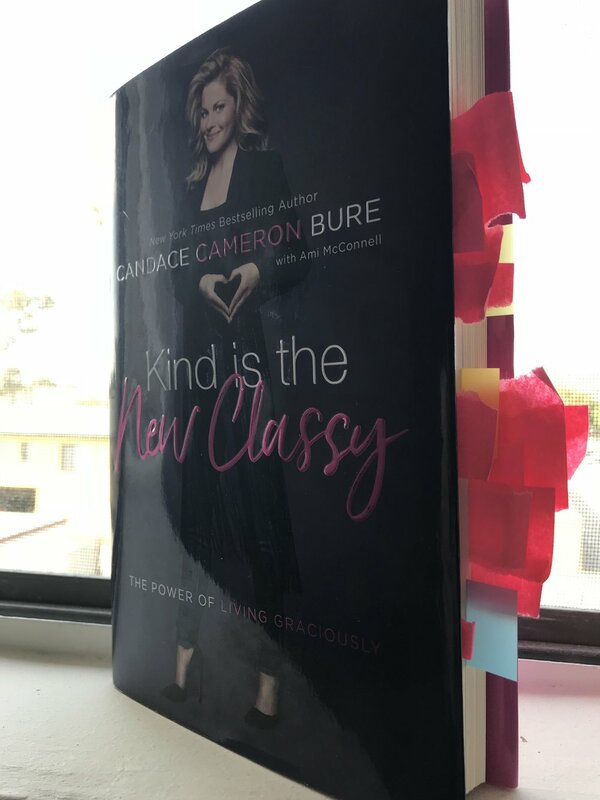 If you can answer yes, then Kind is the New Classy is the book for you! Written by Candace Cameron Bure (@candacebure) with Ami McConnell. While there is not a cure-all available – this book checks some of the boxes. I mean doesn’t that line from the book hit the nail on the head? In the book, Candace is open, honest and genuine. I appreciated that she shared her perspective on being kind and gracious from a women’s viewpoint. While I can’t relate on all levels to everything in the book, I appreciated learning about her life. She used personal experiences to illustrate both good and bad interactions. As you can see I took a lot away from the book. I marked everything that I want to revisit later. Plus, I marked sections where I am using tips and putting them into action. Own your interaction and apologize. We can handle conflict with grace – this one is great for the office. And she shared a great story about a business meeting with producers of Fuller House – when you read it I think you’ll see why I loved it! I like that from the get-go the book challenged me to think beyond my norm via the “Your Turn” sections. Overall Kind is the New Classy was an entertaining and easy read. I found myself wanting to read an entire chapter in one sitting. The chapters were organized well and covered a complete viewpoint before introducing a new concept. Personally, this format lets me absorb more. If you’re open to being invited into a slice of someone’s life and listening to their viewpoints, then I urge you to check out Kind is the New Classy.